HOUSTON — San Jacinto College honored former student-athletes and coaches who have excelled in collegiate and professional baseball at the Legends ceremony, held Friday, Feb. 5 at John Ray Harrison Field at Andy Pettitte Park, located at the San Jacinto College North Campus. Former San Jac student-athletes and coaches recognized at the event included Matt Albers (Chicago White Sox), Duane Walker (retired Major League Baseball player), Chris Rupp (Deer Park High School Head Coach), Rusty Pendergrass (MLB scout), Donald Wright (owner of Just Wright Sports), and Brandon Belt (San Francisco Giants). Belt played for San Jac in 2007, excelling as a pitcher and hitter. He transferred to the University of Texas, where he played two years for the Longhorns. He was drafted by the San Francisco Giants in 2009, moving rapidly through the farm system and joining the MLB team in 2011. He currently plays first base and outfield for the Giants, and was a member of the 2012 and 2014 World Series championship teams. Albert, a relief pitcher for the Chicago White Sox attended San Jacinto College in 2002. His professional career started in 2006 with the Houston Astros. In his 10 years in the majors, primarily as a reliever, he has also pitched for the Baltimore Orioles, Boston Red Sox, Arizona Diamondbacks, and the Cleveland Indians. He was considered the White Sox’ most consistent reliever for the 2015 season, in which he posted an outstanding 1.21 ERA in his 30 outings. Relatives of the late John Ray Harrison, San Jacinto College’s first baseball coach, attended the ceremony, including his wife Barbara, their son Robert, and daughter Nancy (Harrison Farries). The ceremonial first pitch of the game that followed the Legends ceremony was delivered by Larry Wilson, San Jacinto College Board of Trustees Vice Chairman. Wilson is a longtime friend of the Harrison family, is active in community events and an avid supporter of San Jacinto College athletic programs. After the first pitch, members of the Pearland Little League team that played in the 2015 Little League World Series were recognized on the field. AMARIS MOYA shows her Grand Champion Steer at the Galena Park FFA Livestock Show and Auction. The steer was purchased by the North Shore Rotary Club, for $8500. Galena Park ISD held their annual FFA Livestock Show and Auction last November, at the Ag Facility on Holland Avenue. Forty-Five lots were sold, and the unofficial total raised for student scholarships and the program was over $65,000, plus so-called “add-ons” after the official bidding. 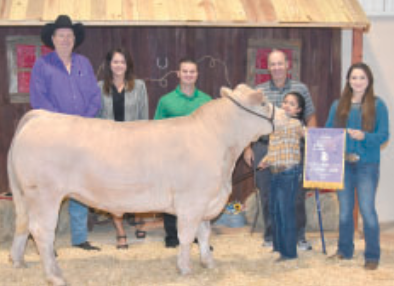 The Grand Champion Steer was raised by Amaris Moya, and sold for $8,500 to the North Shore Rotary Club. Amaris is a junior FFA member, not yet in high school. 2015 program featured a turkey category for the first time, with Franzely Pena showing the GC bird. The FFA clubs involve about 35 students from Galena Park High School, and 50 from North Shore High School. President of the GP FFA is Angelica Pecina, and NS FFA president is Jose Garza. Please see the print edition, or PDF version, for grand champion photos and details. Constable Ken Jones is retiring at the end of his term next January. This vacancy has attracted a great deal of attention and money from potential candidates seeking to fill the Pct. 3 seat. On the Republican ticket is DAN WEBB, running unopposed in the March 1st primary, but will face the Democrat in November. Webb is a DPS special ranger. The Democratic ticket has 9 candidates seeking the Constable’s position. One of these will prevail in the March 1st primary, or a runoff will be held later in April. KEN MELANCON, a 30 year law enforcement officer and captain with the Harris County Sheriff’s office. Jones is retiring after 33 years as Pct. 3 constable, and 50 years in law enforcement.